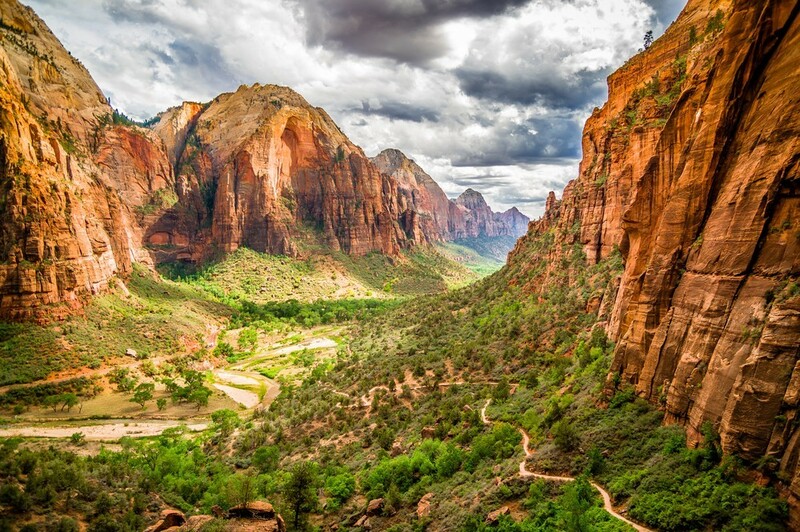 Zion National Park is one of Utah’s most famous landmark and is one of the favorite national parks in the US. Camping is very popular here, so usually, the low-cost campgrounds are full. Fortunately, there are still some places near Zion, which the Bureau of Land Management manages. 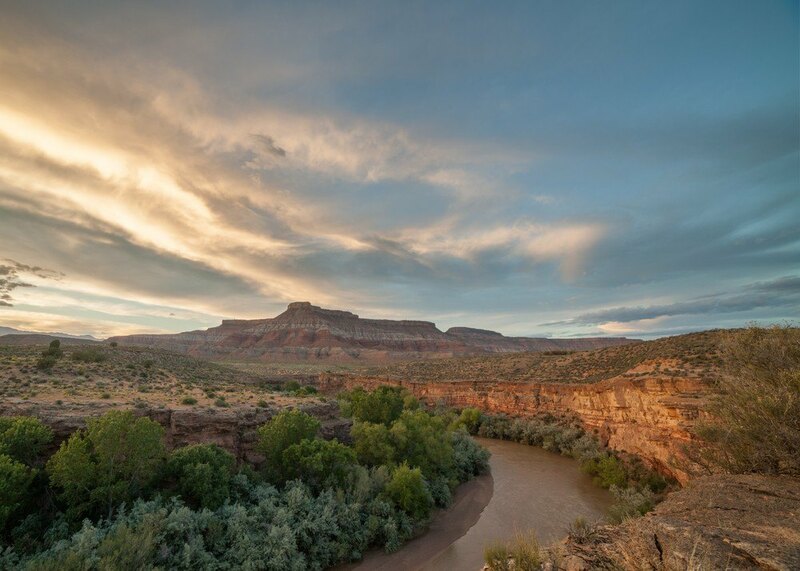 Utah’s BLM is very diverse, offering incredible views, wildlife, and recreational opportunities. Most, if not all, of the best free camping near Zion, is under BLM. Virgin Dam is just around 30 minutes west of Zion. It is a BLM area that is surrounded by desert and has a view of the Virgin river and dam. Though it is not easily accessible, I would say that it's still worth the trip. In addition to being free, the location is peaceful, clean, beautiful, and overall a great camping destination. Camping in the Virgin Dam area requires more sense of adventure than many campgrounds. First of all, the road is rocky and bumpy, so it is not very easy to get in and out of the area. Secondly, it's even worse when it rains because it gets very muddy and difficult to drive on. RVs and 2-wheel drives will have a hard time or will get stuck. Finally, the only thing the site provides are fire rings, but even some areas won’t have them. Since there are no facilities like bathrooms or drinking water, you have to plan for that. Make use of the nearest public restroom or buy some poo bags - just don’t leave your poop behind! The nearest grocery store and other conveniences are probably around 20 minutes away which is a city called Hurricane. Sheep Bridge Road in La Verkin, Utah is very near to both Zion and the Virgin Dam. Getting to the Springfield entrance to Zion is only about a 25-minute drive. It's quite a popular site especially to boon dockers visiting Zion. That said, you might want to start your day early if you want to secure a good spot. Though there's plenty of room to spread out, you still want to be early, so you won't end up settling for a dusty place. One great thing about this area is that there are plenty of hiking and biking trails. You also have breathtaking views of the Virgin River and Zion. Getting to the area is a little bumpy, but if you take it slow, you should be alright. Like most BLM sites, there aren't much amenities. You may find some fire rings, but no water or hookups. However, you can drive to Hurricane or Springfield which has plenty of conveniences. Another one that is in Virgin, Utah, is Flying Monkey Mesa. It's also known as Hurricane Mesa. But Flying Monkey sounds more interesting, I think. Anyways, this area is just around Virgin and La Verkin Utah. It's a little over half an hour from the closest Zion entrance, which is in Springdale. This campsite is quite difficult to get to and locate. Many campers have said their vehicles have gotten stuck. I recommend you check out the road by foot first, if possible. Also, try to avoid driving after rain because the road will be tougher to drive on. I think that is what hinders most people from camping on this site. Flying Monkey Mesa has two locations: one is right after the turn from Mesa Road, and the other one is further down a dirt track. If you do want to feel isolated and away from people, then this campsite is perfect. You have higher chances of being the only one/group. Even if there are other campers in the area, the vastness of the area will still give you some peace and isolation. Flying Monkey Mesa has mountain bike trails for daredevils. The trail is very narrow, with steep falls on both sides. It's also rocky with some unpredictable jumps. Aside from mountain biking, you can also go hiking. 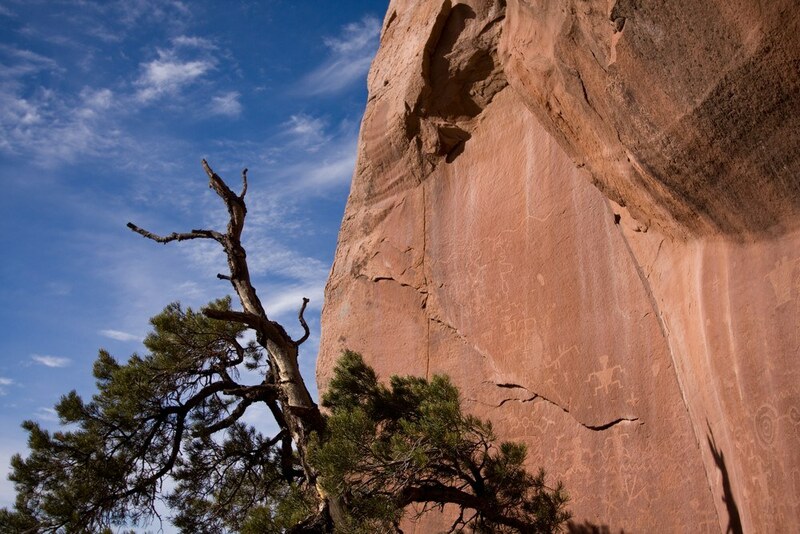 The Smithsonian Butte is probably one of the closest free camping sites to Zion National Park. It is a BLM type, about 7 miles to the Springdale entrance to Zion, which is less than 20 minutes. It's a little over 20 miles to Hurricane, Utah. This camping area is pleasant and away from the crowds of Zion. The sunrise and sunset views are pretty spectacular from the area. It’s also one of the greener sites, compared to the others which are mostly desert. However, it’s hard to get to from Rockville. You’ll need a high ground clearance and four-wheel drive to get through the rocky road. If you go camping here, make sure it is not on federally managed lands. You need to be at least half a mile distance from the either side of the main byway. Also, the dirt road gets muddier after a heavy rain. You should call the local BLM office before you go, to ask about any road updates. 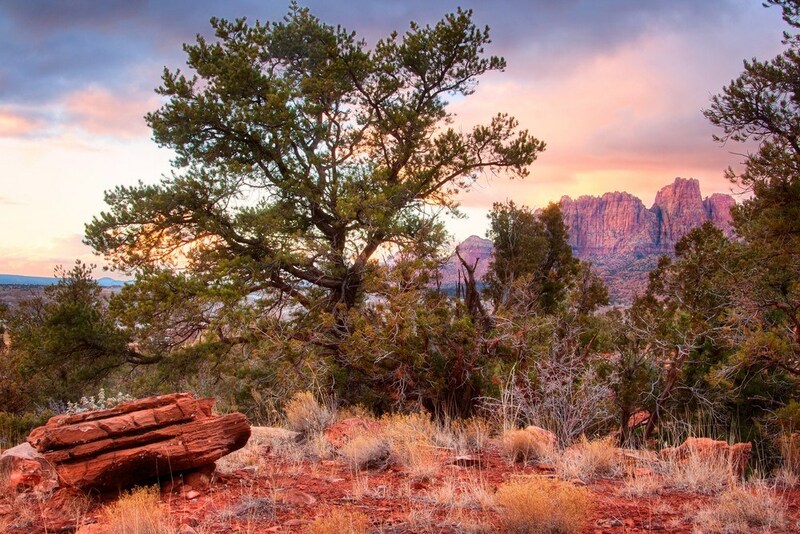 Canaan Mountain Wilderness is right next to the southeast border of Zion. Though they are right next to each other, the drive from one place to the other is almost an hour. 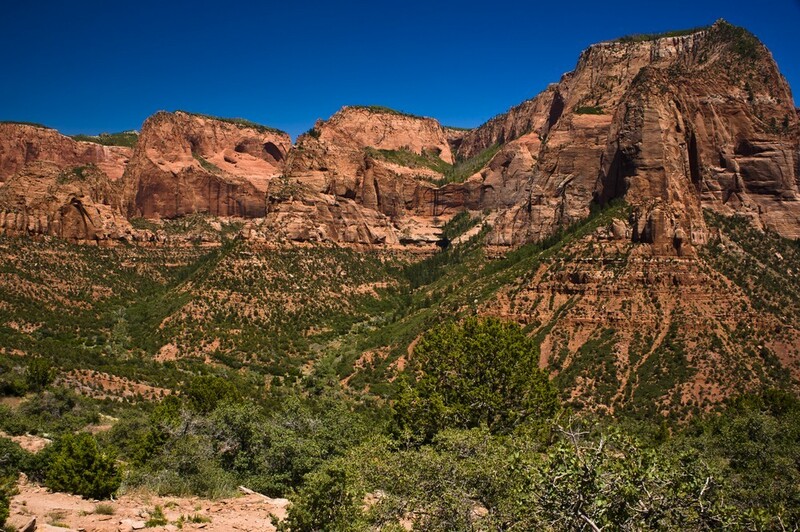 There is also a trail that connects both areas, from the mountain to Springdale and Zion Canyon Visitor Center. It's about 20 miles and will take at least 7 hours on foot. The highway is around 44 miles and passes through Hurricane, La Verkin, and Virgin. The Canaan Mountain Wilderness is managed by BLM and is over 44,000 acres. It offers views of Zion, the Virgin River Valley, and Eagle Crags. There aren't as many hikers here than there are in Zion, but it is no less beautiful. There are many trails ready for exploration, for hiking, biking, and even horseback riding. For camping, make sure you are over at least 200 feet from roads, water sources, and any trail. The sites are very primitive and have no amenities. You may find some fire rings in some locations. If you need anything, keep in mind that the closest city to Canaan is Hilldale. It's on the southern part of the mountain, but there are not many amenities in the area. You'll find more amenities in Hurricane City or the others in the north. As you may have noticed, these campsites are very primitive. That said, you need to prepare a lot of things for camping in these dry camping sites. 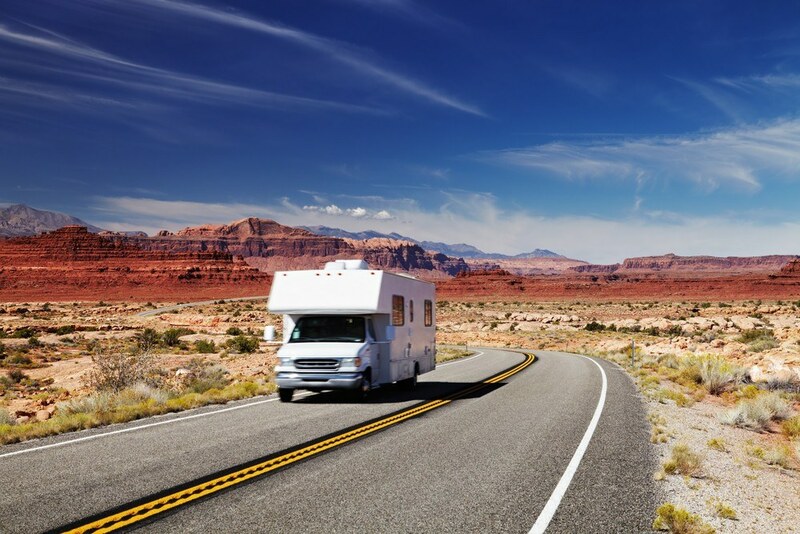 Plan your stops - bathroom, grocery, laundry, refill/restock of supplies, gassing up, etc. For emergencies, I highly recommend you have a stock of Augoson Farms products. Considering how rough the roads are, you could get stuck (though I hope not!). But at least, you’ll have food and tools to help you survive until help comes along. Here’s an Auguson Farms Review for your reference. Check with the BLM offices about the road conditions. You don’t want to be driving right after rain but even a day or two after rain, the road conditions could still be dangerous. Save yourself from disaster and call before you go. Also, check with them what kind of vehicles are suitable for the road. Bring poop bags and trash bags. Let’s follow the leave no trace policy.Bring water purification tablets or a water filter. Get your vehicle checked before you hit the road. Bring spare tires and tools in case of emergencies. Let someone know when and where you are going, especially if the place is known to have no cell service. Camping near Zion doesn’t have to cost a thing - except of course the things you will need to provide yourself. But at least you don’t need to pay for the campsite itself. 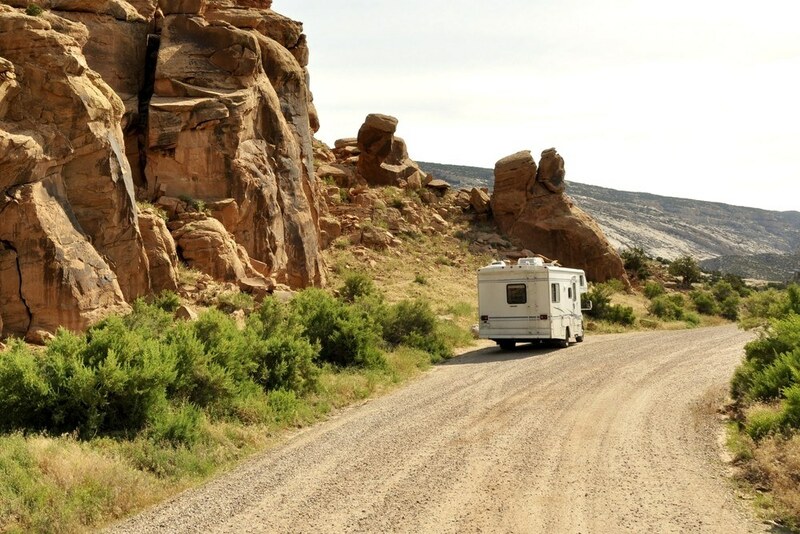 Thanks to the Bureau of Land Management, you can camp at multiple places for free. These sites may not offer a lot of amenities, but I that’s also the real beauty of camping and boondocking. Have you camped in any of these places before? Or do you know where else we can camp for free near Zion? Tell us about it using the comment section below!